For a perfect picture-postcard experience, you just can't beat the island of Santorini. 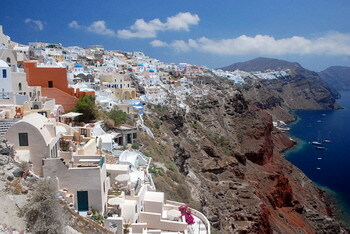 The main island of Santorini itself slopes down to the Aegean Sea. While the island's main port is Athinias, its capital is the city of Firá, which hangs from the very top of the cliff looking down onto the lagoon. Santorini. Photo:CC BY-SA Simm Santorini, along with Anafi, are the only locations in Europe which feature a hot desert climate and Santorini basically experiences two seasons with April to October being the warm, dry season and November to March the colder, rainy season. This offers an opportunity throughout most of the year for visitors to enjoy the best weather. 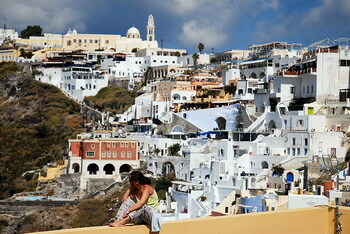 The island's capital, Firá offers a series of white-washed houses hanging on the edge of the high caldera. The city also has two museums of interest to visitors: the Archaeological Museum of Thera and the Museum of Prehistoric Thera, with the latter built on the site of an earlier church destroyed in the 1956 earthquake. There are several shops and cafes to visit along Firá’s narrow footpaths. 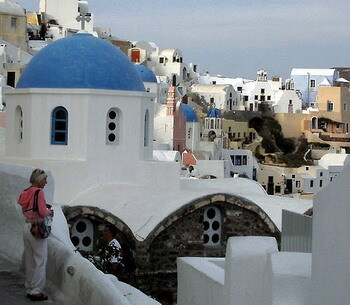 Another great location on the island of Santorini is the beautiful Oia. 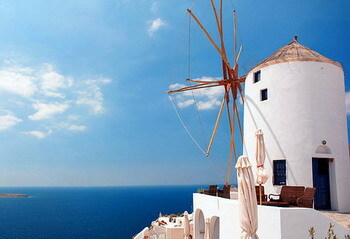 Perched on the cliff's edge, Oia is particularly well-known for its picturesque and white-washed windmill (pictured right).. The town offers the iconic white-washed houses of Santorini, which in many cases have been built into niches, which were formerly the cave houses used by ship crews in the distant past. Between the houses there are narrow alleyways and dotted among them can be seen the traditional blue-roof churches. Besides the fact that the white paint is attractive there was another reason for white-washing the homes. When decorating, the villagers use white lime water, which causes the rainwater which falls on the houses to run down and be collected for use by the residents. Oia Church, Santorini. Photo:CC Nadia Prigoda With many of the houses built into the former caves, this has the added benefit of keeping the houses warm in winter and cool in summer. Besides the iconic windmill, the city has several sights to offer including a ruined castle, right at the pinnacle point of Oia, which was once the eat of the Argyri family under the Venetians in the past. The castle offers an excellent 360-degree view. In the town itself there are many small shops and kiosks selling a range of ethnic handicrafts, jewellery and sourvenirs. Art lovers will find several small art galleries dotted around town, including Art Gallery Oia and The Art Gallery. An interesting popular attraction in Oia is that is sunset viewing - and the sunsets are spectacular indeed. A special event is held every evening from the Sunset Seranade point with crowds of visitors and locals gathered to watch the spectacle, when the white houses and the caldera catch all the colours of the setting sun for a few seconds. Staying over in either Firá or Oia makes for a scenic and truly beautiful location, offering everything a visitor could possibly desire.